Solas Nua's Irish Pocorn! film series and NYU Washington, DC present, "Strange Occurrences in a Small Irish Village" by one of Ireland's top documentarians Aoife Kelleher ("One Million Dubliners"). Solas Nua's Irish film series and NYU Washington, D.C., will present the U.S. premier of “Condemned to Remember” on October 5. 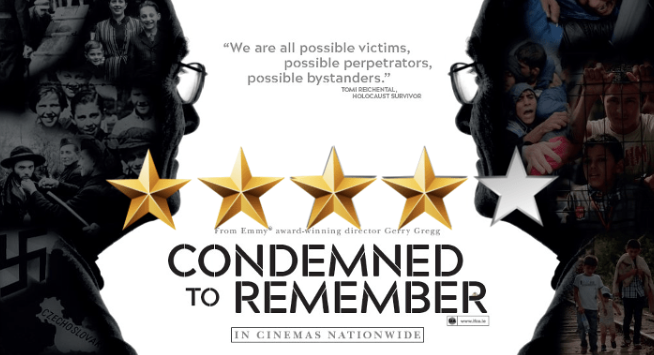 In Emmy Award winning director Gerry Gregg’s third film about Irish Holocaust survivor Tomi Reichental, the 83-year-old continues his mission to tell the world about what happened to him and his family in wartime Slovakia. In his journey across Europe, Reichental connects with Muslim refugees who have faced the kind of cruelty and persecution he remembers vividly from childhood. For Tomi, their fate and the rise of extreme nationalism all across Europe evokes echoes of the darkest days of his life under the jackboot of the Nazis and their collaborators. Gerry Gregg, Tomi Reichental, and American Auschwitz Survivor Irene Weiss will join in a discussion after the film. Sat, Dec. 2, 6:00 p.m.*; Tue, Dec. 5, 7:20 p.m. This poetic, hybrid exploration of the life of legendary sean nós singer Joe Heaney mixes narrative elements with performance footage that goes beyond the traditional music documentary and touches on Ireland's past and present. Filmed lovingly in black and white, the striking imagery of Connemara and Ireland's west coast, and the people of the land anchor this lyrical look at the life of Heaney, the master of sean nós (traditional, unaccompanied singing). The film also features performances from some of the most renowned sean nós singers of today and the artists inspired by Heaney's legacy. Join NYU Washington, DC and Solas Nua for a screening of Emerald City, a film that explores the lives of immigrant Irish construction workers in New York City. The film will be followed by a Q&A session via Skype with Director Colin Broderick. Emerald City is a movie about a hard living crew of Irish construction workers in New York City. They are men in their late thirties/early forties who left Ireland in an era of closeted oppression and sectarian violence. They have spent their adult lives self-medicating against a past that continues to haunt them. The men are hard working, hard partying, likable rogues who are faced with the wreckage of a life spent dodging adult responsibility. Join NYU DC Dialogues and Solas Nua for a screening of the award-winning film Sanctuary by acclaimed Irish film director Len Collin. This film, adapted from an Irish stage play, highlights the forces working against a couple with intellectual disabilities and is credited with overcoming Ireland's restrictive laws regarding prohibition of "handicapped" persons from renting hotel rooms unless married. Larry and Sophie are in love. What could be more natural for them than to want to be alone, together? They bribe the feckless Tom to book them into a hotel for an afternoon’s tryst and look forward to getting to know each other, like countless couples before them. But Larry and Sophie aren’t any couple – they both have intellectual disabilities and Tom is their care worker. By attempting to be intimate, they aren’t just breaking the rules – they’re breaking the law. While Larry and Sophie try to figure out their feelings, their future and how to use a condom, their friends from the training centre escape the not so watchful eye of Tom and go on a joyful rampage through Galway. Both hilarious and heartbreaking, Sanctuary is a truly subversive piece of cinema about two young people trying to be together, in a world doing everything to keep them apart. Irish Popcorn kicked off the 2014 season with gritty feature King of the Travellers at Busboys and Poets. Next came family friendly shorts Anam an Amhráin at the Mount Pleasant Library. On March 31st we screened The Irish Pub at Busboys and Poets. We were delighted to be joined by Alex Fegan and Denis Dwyer, the filmmaker andproducer of The Irish Pub. They took part in a Q&A after the film. The screening was so popular we had to turn people away! In April we screened Silence (directed by Pat Collins) at Rírá. Our May movie was Death of a Superhero, the story of a terminally ill teenaged artist. In June we screened Hill Street a wonderful documentary about skateboarding in Ireland, we were pleased to be joined by the film's director J.J. Rolfe. In July we screened Belfast set punk rock feature Good Vibrations. In September we screened sci-fi comedy Earthbound.